The Fourth of July, also known as Independence Day, is a federal holiday in the United States commemorating the adoption of the Declaration of Independence on July 4, 1776. Families gather together to celebrate the holiday with picnics, parades, barbecues, fireworks, carnivals and concerts. Red, white and blue are the colors of the day. I decided to create some nail art that illustrates the many way we celebrate the holiday. 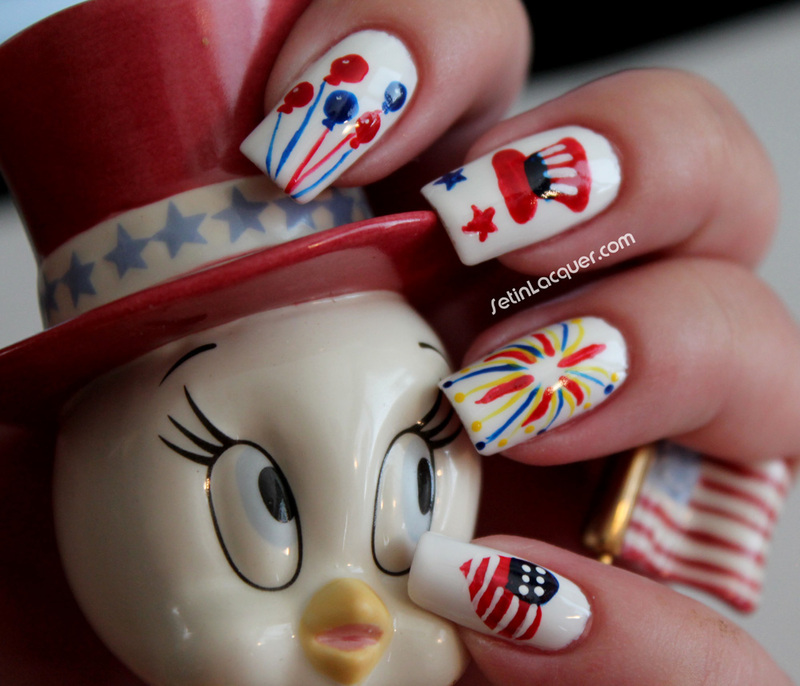 Balloons, Uncle Sam's hat, fireworks, and a love of country were my inspiration for the nail art. I used China Glaze White on White for the base color. I love to use this polish for a as a canvas for nail art. For the artwork itself I used acrylic paints. There are many reasons I like using acrylic paint for artwork - but the number one reason is because I can get so many workable colors from a few $1 bottles of paint. I am LOVING this! I can't even pick a favorite nail because they're all so cute! Thanks! I think my fave is the heart-shaped flag. I love everything about this! My favorite is definitely the heart. So cute! Thank you. That's my favorite too! Awwww, Thanks! But I bet you could do it! Awww!!! This is SUPER ADORABLE!!! Kelly! 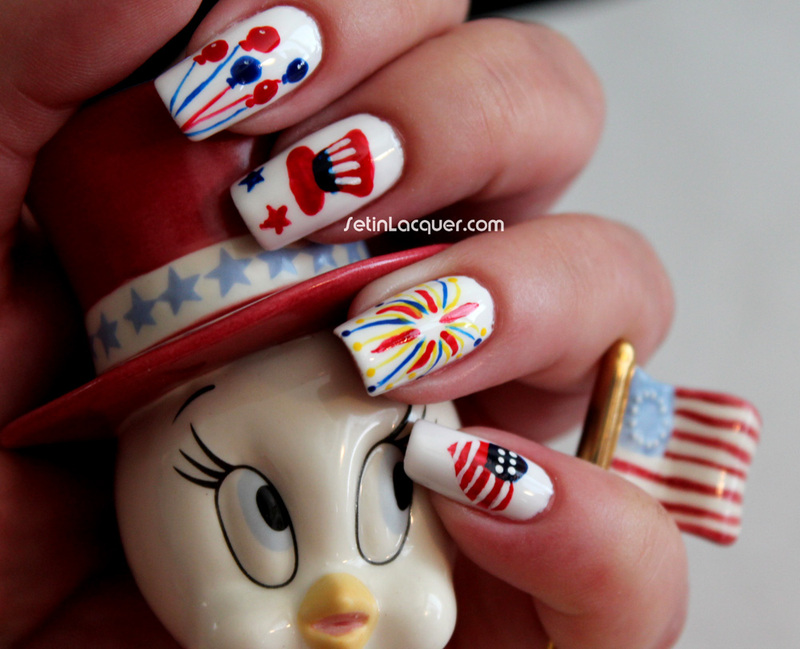 I can't believe how amazing your nail art is! You really should think of becoming a professional. Maybe you could design nail wrap art? Or something. Really your nail art looks like computer made! It's simply amazing! 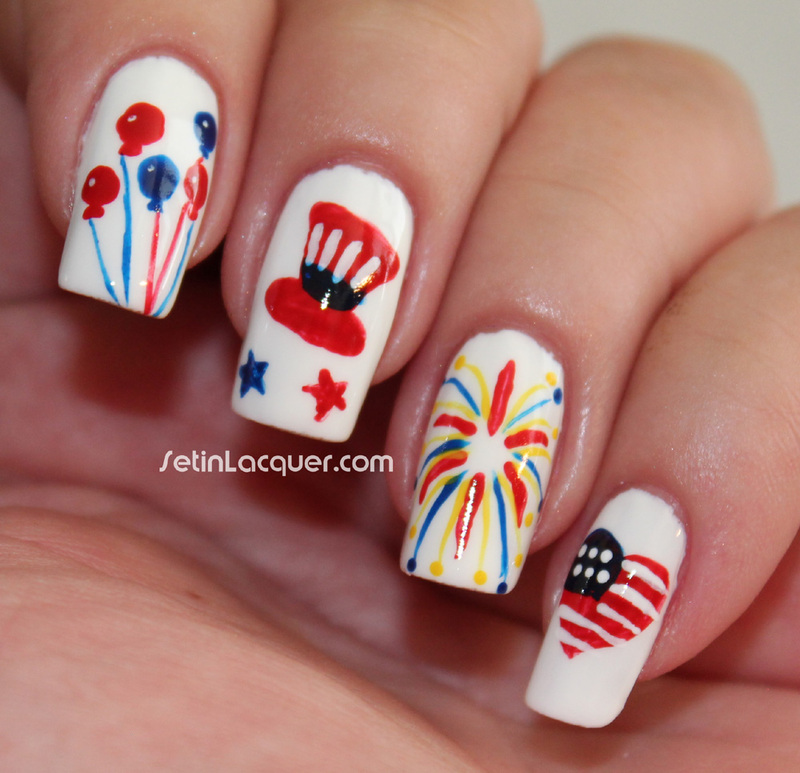 I love them all but my favorite is the heart also, The one I "think" I might be able to do is the fire works! Wish I was 10% of this good! Amazing simply amazing! Orly Sparkling Garbage - It's not garbage! Animal striped nail art? Or is it Camouflage?